By Jennifer Burcke on April 2, 2012 Visit Jennifer's Website. I had big plans for this post. I spent hours researching and preparing for this story just in time for Easter weekend. In fact, I even enlisted the help of my children. They donned their aprons and spent a few hours in the kitchen assisting me. We eagerly awaited the fruits of our labor. We cautiously removed the specimens after a 24-hour wait. Then we looked at each other and came to the conclusion that sometimes things just don’t turn out the way you expect them to. This was supposed to be my chance to share with you the way in which I used ingredients found in our kitchen to naturally color eggs for our Easter table. 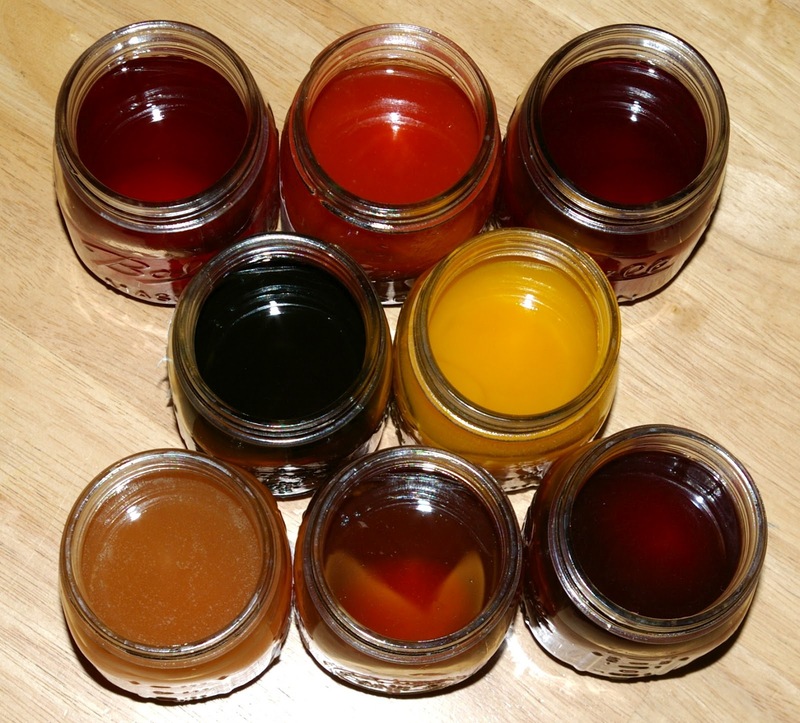 Last year I had shared my technique for making egg dye using food coloring and vinegar instead of a store-bought kit. The results are incredible. The food coloring solution yielded rich, jewel-toned eggs in a rainbow of deep colors. I had read several accounts of coloring eggs in a more old-fashioned manner. Food items could be added to boiling water and used to impart their natural coloring to the eggs that would bathe in the liquid overnight. It seemed like a worthwhile endeavor. In fact, it seemed like a good science experiment that would result in egg salad for lunch. 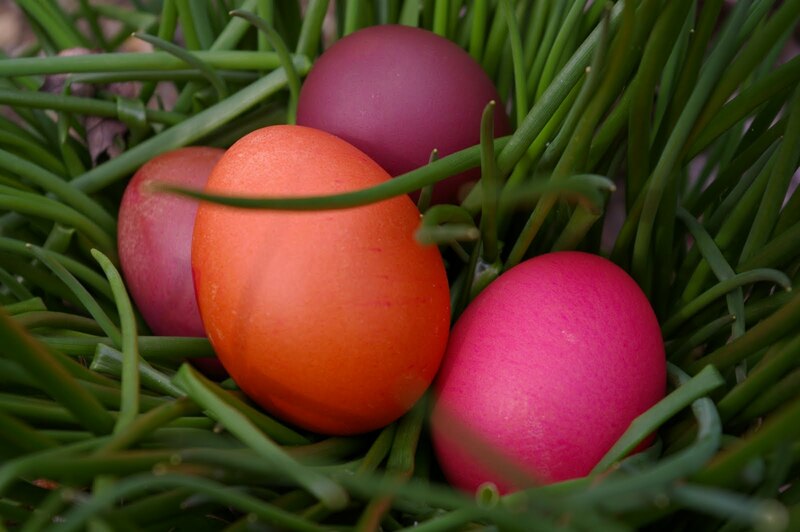 I wondered about using natural coloring to alter the appearance of eggs that Mother Nature had already given color to. There are seven heritage breed hens living at 1840 Farm. They all have their own distinct personalities and appearances. They do have one powerful trait in common: They all lay brown eggs. I considered purchasing white-shelled eggs at the grocery store, but chose to move forward with brown-shelled eggs instead. 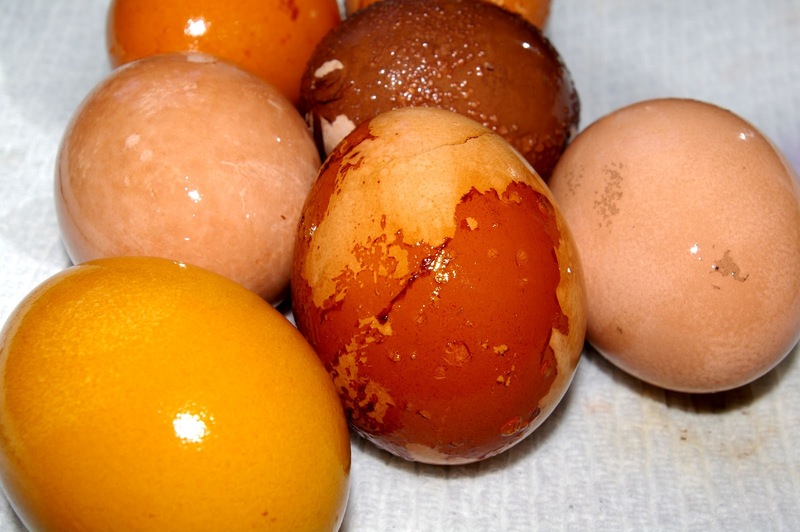 Last year, I had been surprised at how vibrant the colors had held on our brown eggshells. I could only hope that the natural colorants would follow suit. My children surveyed the kitchen, taking a full inventory. As children, they have personal knowledge of food items that result in stained clothes or a parent who points out the fresh stain on their brand-new Sunday best. It didn’t take long for them to make a few choices. In a matter of minutes, we had collected more ideas than we had eggs to color. Clearly we were going to need to do a little pre-experiment experimenting. 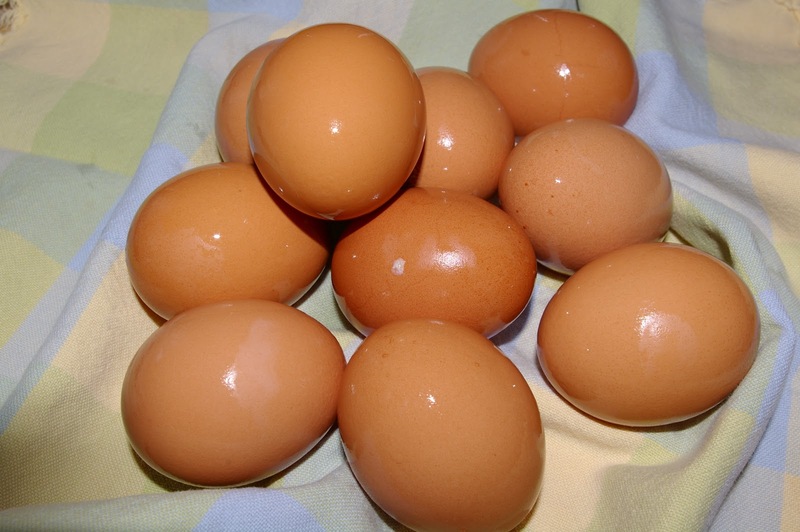 As we prepared to ready the solutions, I began to boil the eggs. I followed the same process as I detailed last year. Once the eggs were resting in their ice bath, I reserved the warm water in the boiling pot. Instead of pouring it down the drain, I planned to use it to entice the color out of the naturally colorful items we had collected. We collected pint-size canning jars and lids. Then we started preparing the ingredients we hoped would bring the color to our hard-boiled eggs. The first jar soon held one cup of shredded carrots. The second jar was filled with one cup of chopped spinach leaves. A cup of frozen blueberries and a cup of frozen raspberries each found their place in their own jars. Then we moved on to beverages. I had some coffee left over from the morning’s pot, which went into the next jar. Of course, the addition of coffee led to an idea regarding tea. We quickly looked through our assortment of tea and found a red rooibos variety that seemed to be our best choice. My children put great thought into how many tea bags would be necessary and decided on the number four. It seemed reasonable to me, as a single teabag always leaves a bright red stain on the plate where it rests after being used. I had read that onion skins would produce a lovely yellow color. So we went to work removing the papery skins from six onions and placing them in a bowl. I also knew from personal experience that red cabbage was capable of producing a blue stain, so it was next. Then I moved over to the spice drawer and surveyed the contents. Turmeric was the clear winner, as I knew it was responsible for the canary color of yellow mustard. While we were in the spice drawer, we also decided to give paprika a test. Suddenly, we had an entire collection of edibles waiting for their boiling water bath. I carefully added one cup of the hot water to each container with the exception of the brewed coffee and waited to see what kind of solutions would develop. Within 10 minutes we had colorful solutions ranging from yellow to dark russet brown. The tea and raspberries had both created rose-colored solutions. Blueberries and cabbage both created light blue mixtures. The carrots, onions and the spinach had imparted very little color to the water they were steeping in. Two tablespoons of turmeric had produced the most opaque color of all and seemed sure to create a deeply colored egg. My children surveyed the solutions, placing a few drops of each onto a paper towel to test their strength. They quickly determined that onion and spinach were unlikely to color our eggs and needed to be eliminated from the experiment. We strained the remaining mixtures each into their own jars and labeled them. As soon as the liquids were room temperature, I added one tablespoon of white vinegar to each … as I knew that it would help to set the color on the eggshell. Each egg was lowered gently into its jar and the lids were secured. Now it was time to place the collection of jars in the refrigerator and wait 24 hours to see what would develop. My children were anxious to see the results of our experiment and so was I. I removed the tray of jars from the refrigerator and prepared paper towels to give these naturally colored eggs a place to rest. I uncovered the tea solution and gently poured it down the drain. The egg that remained was still brown with the slight hint of faint pink. As I held it in my hand, I realized that the faint pink was merely a thin film of the outer layer of eggshell that had started to dissolve. It was this film that held the color of the solution it had been resting in. In fact, the egg that was revealed once I had rubbed this outer layer away was not the beautiful pink that I had hoped for. The eggshell was a sickly light brown instead. I reasoned that perhaps the tea solution was not concentrated enough to color the egg. 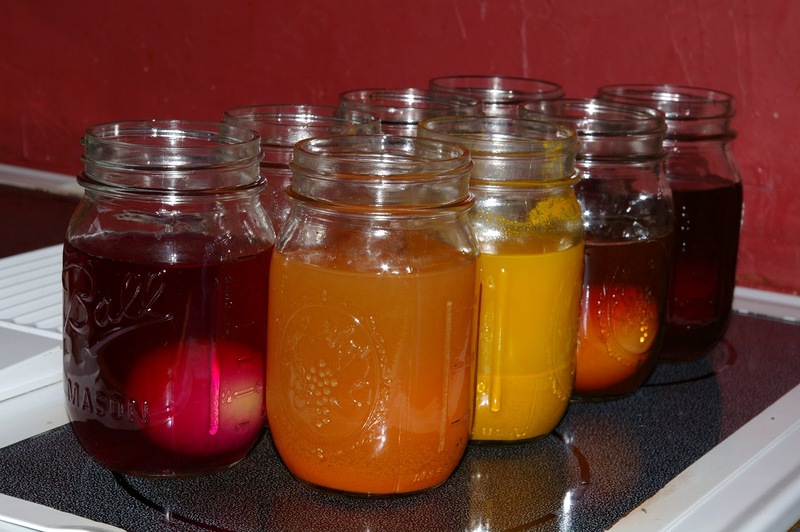 I moved on to each of the other jars, carefully pouring out the liquid and removing the eggs. Each time I found that the egg had suffered the same fate. They all had a thin layer of lightly colored, brown-based film that disappeared with the touch of my hand. Finally, I came to the last jar, which contained the turmeric. When I uncovered that egg, I found that it had actually colored the eggshell without dissolving it. 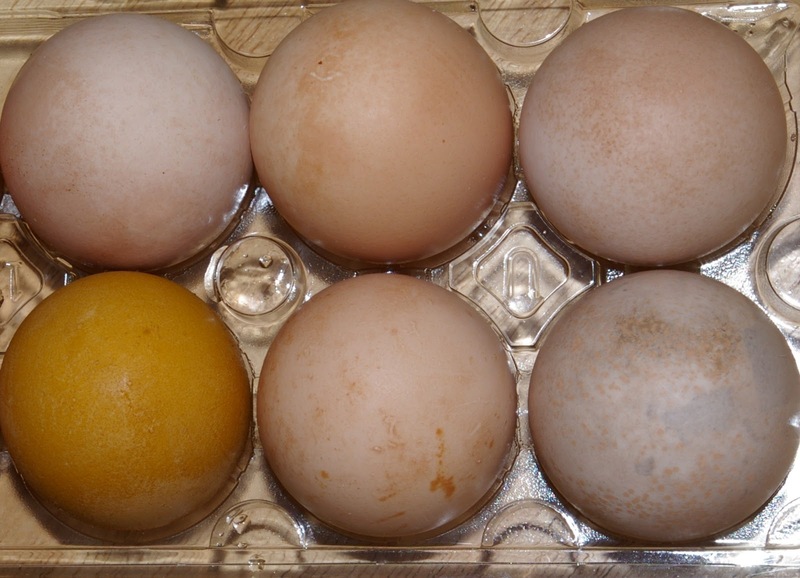 One egg out of eight had resulting in a naturally colored eggshell. I was dismayed and disappointed. One colored egg out of the eight we attempted was not the final result that I had been hoping for. My children took it better than I did. They simply discerned, in the way children do, that it simply didn’t work. They put down their aprons, went back to their normal routine, and looked forward to eating the egg salad I had promised for lunch. I didn’t accept the epic failure of this experiment as easily as they had. I wanted to understand why our experiment hadn’t worked. I wanted an answer. Was it the brown eggshells? Was it the items we had chosen to bring their natural colorants to the shells? I couldn’t be sure about the brown shells, but I had seen photos of eggs that had been colored using blueberries, cabbage and coffee. They hadn’t resembled the eggs on the counter before me. 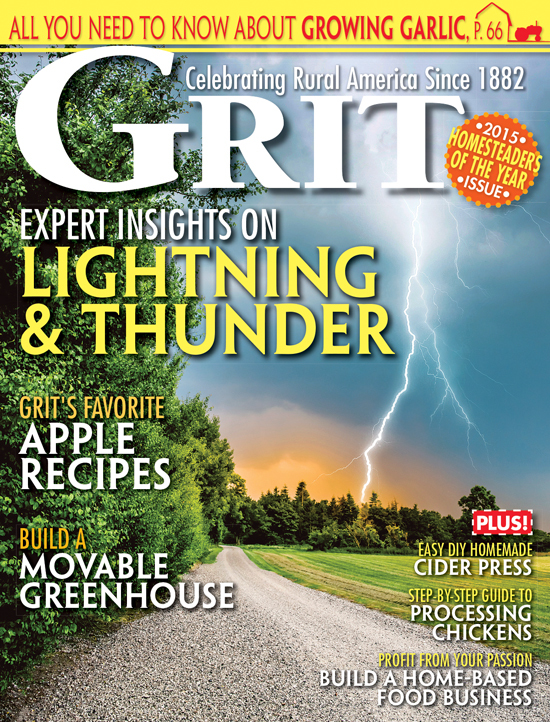 If they had, I would have never been inspired to give this process a try in our kitchen. The eggs we had were definitely not of the inspiring variety. As I stood at the kitchen sink rinsing out the glass jars, it came to me. The vinegar had begun to dissolve the eggshells in the same way it had during the naked egg experiment we had done back in February. Now that I had a reason, or at least a partial one, why the eggs had resisted taking on the natural colors I had planned for them, there was only one thing left to do. It was time to make egg salad out of our bleakly colored eggs. As I inspected what had become of our eight eggs, I realized something. In my quest to produce eggs that were naturally and beautifully colored, I had failed. In fact, I had taken a naturally and beautifully brown egg and transformed it into a collection that could have taken center stage in a Tim Burton movie. I began to peel these dull eggs and couldn’t help but stop to reflect on the irony of this experience. In my quest to naturally color eggs that I already found to be beautiful, I had removed every ounce of natural beauty from them. These eggs were not the brilliant color that I find in our coop every day. Those eggs are beautiful in a breathtakingly natural way. As I handle them I am always amazed at how unique they are, with the occasional small freckles and the full range of brown color. The sight of those fresh eggs never ceases to amaze me. It still seems truly incredible that our seven hens can produce something that is such a marvel of nature right outside our farmhouse door. I should have known better than to try and improve on the natural beauty of Mother Nature. 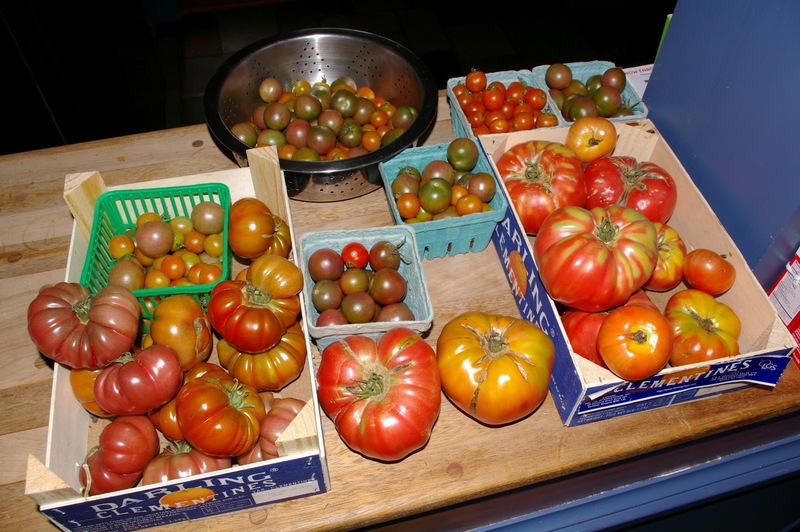 I would never dare to alter the color of an heirloom tomato out in the 1840 Farm tomato patch. It would seem ridiculous to do so. Sometimes, nature really does know best. Maybe this was one of those times. 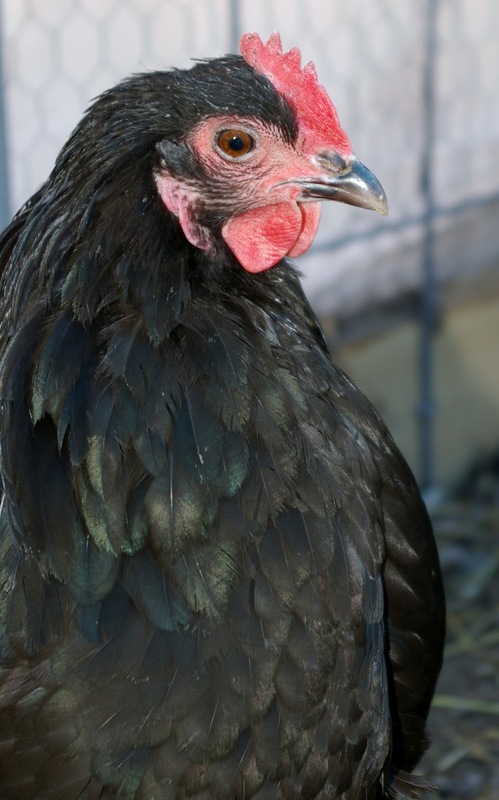 Mother Nature already offered breeds of hens that could lay eggs in a variety of colors. Maybe I should just leave well enough alone. Maybe I should delight in the fact that in a matter of weeks, day-old chicks will be arriving that will bring new colors to the egg carton at 1840 Farm. I went back to my lunch preparation. I removed the lackluster shells to reveal the cooked eggs underneath. Moments later I was cutting the hard-boiled eggs into small pieces and placing them in the bowl. While I was unhappy with the results of our egg-coloring experiment, I was thrilled with the result of the bigger experiment. Our journey to become a chicken-keeping family had made these fresh eggs appear on our lunch table. While we have been enjoying fresh eggs for over a year, the sight of those eggs still brings an enormous sense of pride to the members of my family. In spite of their drab exterior, these eggs were no exception. I mixed the cubed eggs with mayonnaise and a touch of mustard. My family gathered together around the farmhouse table and ate lunch, talking about the egg-coloring experience and its failure to produce the colors we had wanted. We laughed and decided that we clearly weren’t meant to naturally color eggs for the Easter table. While we talked, we commented, as usual, about the delicious taste of the fresh eggs in our egg salad. I sat and enjoyed the moment filled with the warmth of family and the satisfaction of knowing that there would be more fresh eggs waiting for me in the coop the next morning. As I collect them, I will happily survey them before placing them in the egg basket.I will not be tempted to try and improve on their perfect appearance. Instead, I will celebrate the beauty in the fact that they will provide a nourishing meal for my family. When we sit together at our farmhouse table and enjoy them together, I know that the experience will be naturally beautiful. In a few short weeks, the new chicks will be arriving at 1840 Farm. A few of the breeds were chosen specifically for their naturally beautiful, unique eggshells. To make sure that you don’t miss any of the excitement, giveaways or unending supply of cute photos of baby chicks during the Year in the Life at 1840 Farm series, follow us on Facebook to read the daily news from the coop at 1840 Farm. You’re always welcome at 1840 Farm. Visit our blog at www.1840farm.wordpress.com. For daily updates about the happenings at 1840 Farm, follow us on Facebook and Twitter.